Little surprises crop up on my Facebook page. The good ones are not trying to seduce me into buying useless stuff. The best ones have actual nautical content that speaks directly to my soul. Today’s serendipity was a posting from Chip Hanauer’s The Boat Guy website. It specifically talked about a video blog post in which he talked about San Francisco Pelicans. I do love me a good Pelican and often wax nostalgic about the Pelican in my past, Old Time Song. Not being a native Pacific Northwesterner I had not heard of Chip before. Turns out he is a retired championship hydroplane racer. This just makes his story that much cooler. It’s like an F-16 pilot ratcheting his flight regime down to Piper Cubs. Just as the Cub distills flying down to an activity that is accessible and promotes a sense of easily relatable experience the Pelican brings sailors together in community around their vessels. The 12 foot San Francisco Pelican packs a lot of security into it’s short length. The cockpit is deep and wide. Although the flare of the sides makes her initially tender the reserve buoyancy that builds quickly as the boat heels makes her as solid as a rock. My Pelican never capsized and I always felt very safe on that score. While sailing with a cap full of windand one of my more daring (read freaking crazy) friends we made an effort to get her over. This was on a lake where we knew the shore was in safe swimming distance. We couldn’t do it. By the time we had water washing over the rail she was as stable as a cement foundation. 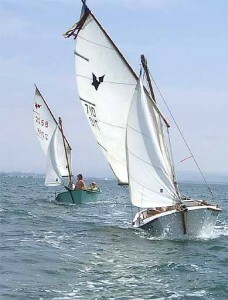 There were times when I wished the boat was better in light winds. 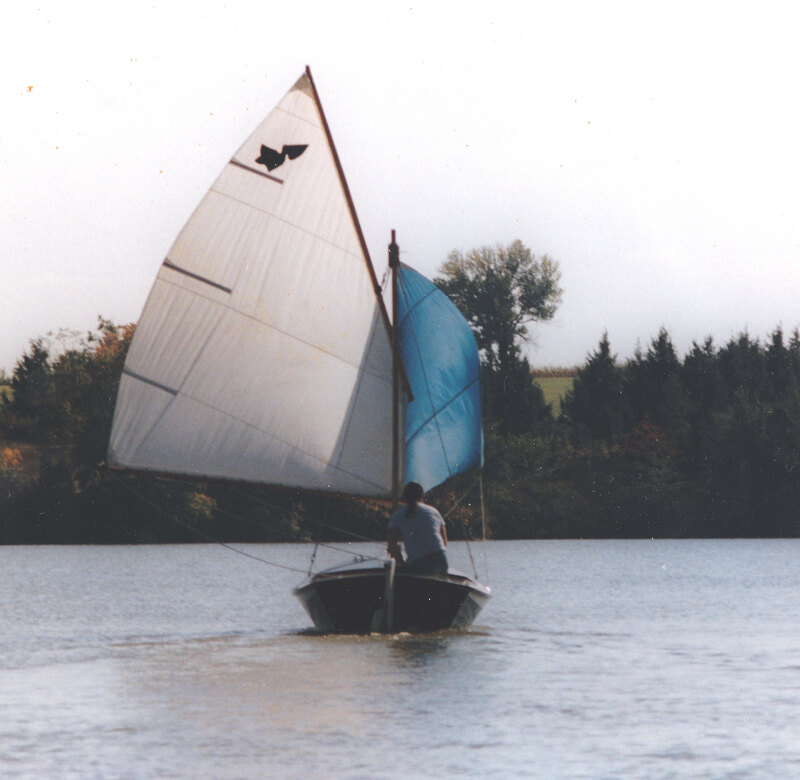 I never got around to mounting a small outboard on the transom but she always got me home. Only occasionally did she make me break out the horribly inefficient paddle I kept under the forepeak. The Pelican is a good little boat for trailering. Mine tracked well and behaved itself on the launching ramps. Set up time was fairly quick and was only delayed by the curiosity seekers attracted by her unusual look. As a Pelican owner you quickly develop a set patter that moves the conversation on quickly. Check out The Boat Guy. You will enjoy the video. It’s professionally produced and very entertaining. The fact that the Puget Sound is home to quite a few Pelicans makes me feel a little more at home. This entry was posted in Podcasts, Sailor's crafts and tagged boat, Boat Guy, Chip, Francisco, Hanauer, hydroplane, launch, Pelican, sailboat, sailing, sailor, sails, San, trailer, water. Bookmark the permalink.